If you’ve followed my I Want series for any length of time, you’re probably well aware that I have what you might call a shoe addiction. In fact 5 of the twenty-five posts I’ve made in the series so far have been some sort of shoe — be it boots to be worn on the pitch, or sneakers to wear off it — far more than any other category of things I want. And the latest pair to get added to that list is the fire that is the Nike Free Flyknit Mercurial. 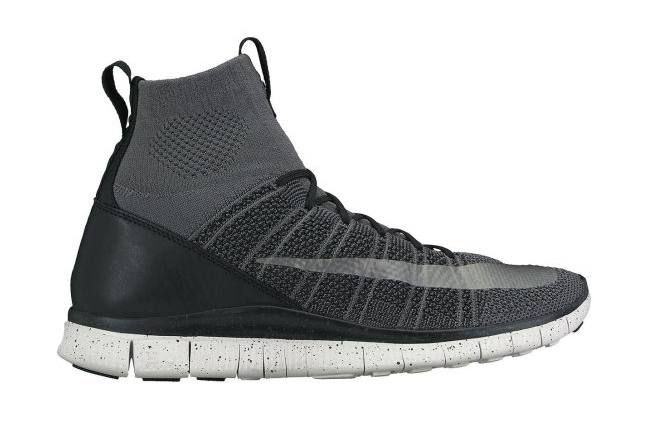 Fusing the DynamicFit sock-like neck, Flywire and leather upper inspired by soccer’s Mercurial Superfly with the uber-comfortable Nike Free running shoe outsole, these stylish mids would look great when paired with the jeans, khakis or joggers of your choice this fall. And since they apparently come in not only the “dark grey” beauts above, but also wolf, platinum and volt (from last summer!?!?) colorways too, there’s a pair for everyone. Of course, that’s presuming you’re willing to drop some coin. Though they show as “COMING SOON” on Nike’s site under “Flyknit” shoes for $200, the item page itself says the shoe is “no longer available”. And scouring the likes of eBay or Amazon, you can expect to drop anywhere from $250 to north of a $800. Previous Post: why does this even need explaining? right after launching it generally within the United states and U.K.